Registering Azure Stack with Azure allows you to download marketplace items from Azure and to set up commerce data reporting back to Microsoft. After you register Azure Stack, usage is reported to Azure commerce and you can see it under the Azure billing Subscription ID used for registration. The information in this article describes registering Azure Stack integrated systems with Azure. For information about registering the ASDK with Azure, see Azure Stack registration in the ASDK documentation. Registration is required to support full Azure Stack functionality, including offering items in the marketplace. In addition, you will be in violation of Azure Stack licensing terms if you do not register when using the pay-as-you-use billing model. To learn more about Azure Stack licensing models, please see the How to buy page. The subscription ID for an Azure subscription. Only EA, CSP, or CSP shared services subscriptions are supported for registration. CSPs need to decide whether to use a CSP or APSS subscription. To get the ID, sign in to Azure, click All services. Then, under the GENERAL category, select Subscriptions, click the subscription you want to use, and under Essentials you can find the Subscription ID. Germany cloud subscriptions are not currently supported. The username and password for an account that is an owner for the subscription. The user account needs to have access to the Azure subscription and have permissions to create identity applications and service principals in the directory associated with that subscription. We recommend that you register Azure Stack with Azure using least-privilege administration. For more information on how to create a custom role definition that limits access to your subscription for registration, see create a registration role for Azure Stack. Registered the Azure Stack resource provider (see the following Register Azure Stack Resource Provider section for details). After registration, Azure Active Directory global administrator permission is not required. However, some operations may require the global administrator credential. For example, a resource provider installer script or a new feature requiring a permission to be granted. You can either temporarily reinstate the account’s global administrator permissions or use a separate global administrator account that is an owner of the default provider subscription. The user who registers Azure Stack is the owner of the service principal in Azure Active Directory. Only the user who registered Azure Stack can modify the Azure Stack registration. If a non-admin user that is not an owner of the registration service principal attempts to register or re-register Azure Stack, they may encounter a 403 response. A 403 response indicates the user has insufficient permissions to complete the operation. If you don’t have an Azure subscription that meets these requirements, you can create a free Azure account here. Registering Azure Stack incurs no cost on your Azure subscription. If you have more than one Azure Stack, a best practice is to register each Azure Stack to its own subscription. This will make it easier for you to track usage. Ensure the output returns FullLanguageMode. If any other language mode is returned, registration needs to be run on another machine or the language mode needs to be set to FullLanguageMode before continuing. Use the latest PowerShell for Azure Stack to register with Azure. If the latest version is not already installed, see install PowerShell for Azure Stack. The Azure Stack tools GitHub repository contains PowerShell modules that support Azure Stack functionality; including registration functionality. During the registration process, you need to import and use the RegisterWithAzure.psm1 PowerShell module, found in the Azure Stack tools repository, to register your Azure Stack instance with Azure. To ensure you are using the latest version, you should delete any existing versions of the Azure Stack tools and download the latest version from GitHub before registering with Azure. Your Azure Stack deployment may be connected or disconnected. Connected means you have deployed Azure Stack so that it can connect to the Internet and to Azure. You either have Azure Active Directory (Azure AD) or Active Directory Federation Services (AD FS) for your identity store. With a connected deployment, you can choose from two billing models: pay-as-you-use or capacity-based. With the disconnected from Azure deployment option, you can deploy and use Azure Stack without a connection to the Internet. However, with a disconnected deployment, you are limited to an AD FS identity store and the capacity-based billing model. When you register Azure Stack with Azure, you must provide a unique registration name. An easy way to associate your Azure Stack subscription with an Azure registration is to use your Azure Stack Cloud ID. Azure Stack registrations using the capacity-based billing model will need to change the unique name when re-registering after those yearly subscriptions expire unless you delete the expired registration and re-register with Azure. Use these steps to register Azure Stack with Azure using the pay-as-you-use billing model. All these steps must be run from a computer that has access to the privileged endpoint (PEP). For details about the PEP, see Using the privileged endpoint in Azure Stack. Connected environments can access the internet and Azure. For these environments, you need to register the Azure Stack resource provider with Azure and then configure your billing model. To register the Azure Stack resource provider with Azure, start PowerShell ISE as an administrator and use the following PowerShell cmdlets with the EnvironmentName parameter set to the appropriate Azure subscription type (see parameters below). Add the Azure account that you use to register Azure Stack. To add the account, run the Add-AzureRmAccount cmdlet. You are prompted to enter your Azure account credentials and you may have to use 2-factor authentication based on your account’s configuration. EnvironmentName The Azure cloud subscription environment name. Supported environment names are AzureCloud, AzureUSGovernment, or if using a China Azure Subscription, AzureChinaCloud. $CloudAdminCred = Get-Credential -UserName <Privileged endpoint credentials> -Message "Enter the cloud domain credentials to access the privileged endpoint." For more information on the Set-AzsRegistration cmdlet, see Registration reference. The process takes between 10 and 15 minutes. When the command completes, you see the message "Your environment is now registered and activated using the provided parameters." You can disable usage reporting with the UsageReportingEnabled parameter for the Set-AzsRegistration cmdlet by setting the parameter to false. If you are registering Azure Stack in a disconnected environment (with no internet connectivity), you need to get a registration token from the Azure Stack environment and then use that token on a computer that can connect to Azure and has PowerShell for Azure Stack installed. For more information on the Get-AzsRegistrationToken cmdlet, see Registration reference. The registration token is saved in the file specified for $FilePathForRegistrationToken. You can change the filepath or filename at your discretion. Save this registration token for use on the Azure connected machine. You can copy the file or the text from $FilePathForRegistrationToken. $RegistrationToken = "<Your Registration Token>"
Save the registration resource name and the registration token for future reference. Next, you need to retrieve an activation key from the registration resource created in Azure during Register-AzsEnvironment. The activation key is saved in the file specified for $KeyOutputFilePath. You can change the filepath or filename at your discretion. You can use the Region management tile to verify that the Azure Stack registration was successful. This tile is available on the default dashboard in the administration portal. The status can be registered, or not registered. 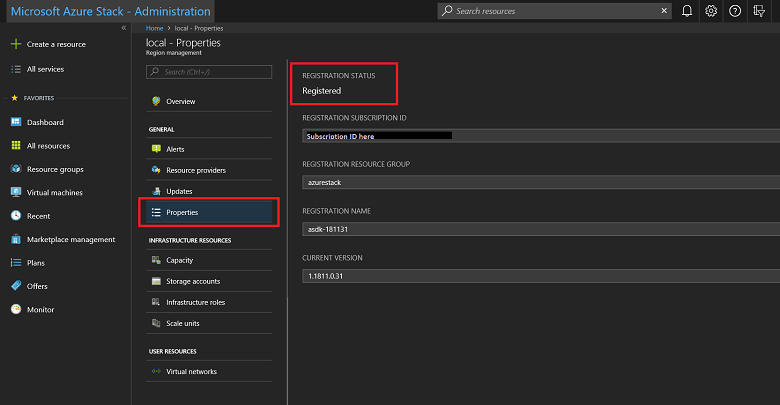 If registered, it also shows the Azure subscription ID that you used to register your Azure Stack along with the registration resource group and name. Sign in to the Azure Stack administration portal. From the Dashboard, select Region management. Select Properties. This blade shows the status and details of your environment. The status can be Registered, Not registered, or Expired. Registration resource group: The Azure resource group in the associated subscription containing the Azure Stack resources. Use the Azure portal to view the Azure Stack app registrations. Sign in to the Azure portal using an account associated to the subscription you used to register Azure Stack. Switch to the tenant associated with Azure Stack. Navigate to Azure Active Directory > App registrations > View all applications. Azure Stack app registrations are prefixed with Azure Stack. Alternatively, you can verify if your registration was successful by using the Marketplace management feature. If you see a list of marketplace items in the Marketplace Management blade, your registration was successful. However, in disconnected environments, you will not be able to see marketplace items in Marketplace management. After registration is complete, the active warning for not registering will no longer appear. In disconnected scenarios, you will see a message in Marketplace management asking you to register and activate your Azure Stack, even if you have registered successfully. After you renew your capacity-based yearly subscription. When you change your billing model. When you scale changes (add/remove nodes) for capacity-based billing. You first need to remove the activation resource from Azure Stack, and then the registration resource in Azure. Next, to remove the registration resource in Azure, ensure you are on an Azure connected computer, sign in to the correct Azure PowerShell context, and run the appropriate PowerShell cmdlets as described below. You have now completely unregistered in a disconnected scenario and must repeat the steps for registering an Azure Stack environment in a disconnected scenario. For Azure Stack environments that use a capacity billing model, turn off usage reporting with the UsageReportingEnabled parameter using either the Set-AzsRegistration or the Get-AzsRegistrationToken cmdlets. Azure Stack reports usage metrics by default. Operators with capacity uses or supporting a disconnected environment needs to turn off usage reporting. Moving a registration resource between resource groups under the same subscription is supported for all environments. However, moving a registration resource between subscriptions is only supported for CSPs when both subscriptions resolve to the same Partner ID. For more information about moving resources to a new resource group, see Move resources to new resource group or subscription. You can use Set-AzsRegistration to register Azure Stack with Azure and enable or disable the offer of items in the marketplace and usage reporting. A global Azure subscription of any type. You must also be logged in to Azure PowerShell with an account that is an owner or contributor to that subscription. PrivilegedEndpointCredential PSCredential The credentials used to access the privileged endpoint. The username is in the format AzureStackDomain\CloudAdmin. PrivilegedEndpoint String A pre-configured remote PowerShell console that provides you with capabilities like log collection and other post deployment tasks. To learn more, refer to the using the privileged endpoint article. BillingModel String The billing model that your subscription uses. Allowed values for this parameter are: Capacity, PayAsYouUse, and Development. MarketplaceSyndicationEnabled True/False Determines whether or not the marketplace management feature is available in the portal. Set to true if registering with internet connectivity. Set to false if registering in disconnected environments. For disconnected registrations, the offline syndication tool can be used for downloading marketplace items. UsageReportingEnabled True/False Azure Stack reports usage metrics by default. Operators with capacity uses or supporting a disconnected environment needs to turn off usage reporting. Allowed values for this parameter are: True, False. RegistrationName String Set a unique name for the registration if you are running the registration script on more than one instance of Azure Stack using the same Azure Subscription ID. The parameter has a default value of AzureStackRegistration. However, if you use the same name on more than one instance of Azure Stack, the script fails. Get-AzsRegistrationToken generates a registration token from the input parameters. Could not retrieve mandatory hardware info for $hostName. Please check physical host and connectivity then try to re-run registration. Cannot connect to $hostName to get hardware info - please check physical host and connectivity then try to re-run registration. Cause: this is typically because we try to obtain hardware details such as UUID, Bios and CPU from the hosts to attempt activation and were not able to due to the inability to connect to the physical host. When trying to access Marketplace management, an error occurs when trying to syndicate products. Cause: this usually happens when Azure Stack is unable to access the registration resource. One common reason for this is that when an Azure subscription’s directory tenant changes it resets the registration. You can't access the Azure Stack marketplace or report usage if you've changed the subscription’s directory tenant. You need to re-register to fix this issue. 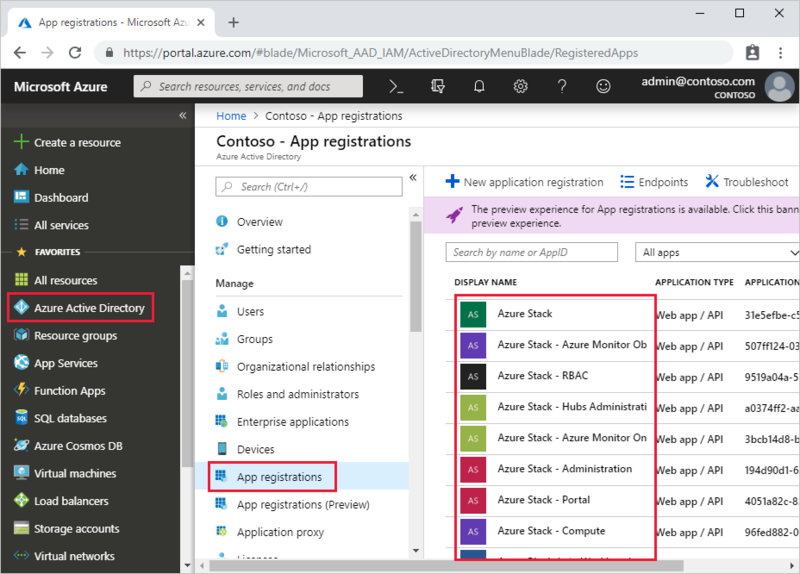 Marketplace management still asks you to register and activate your Azure Stack even when you've already registered your stamp using the disconnected process. Cause: this is a known issue for disconnected environments. You can verify your registration status by following these steps. In order to use Marketplace management, you will need to use the offline tool.